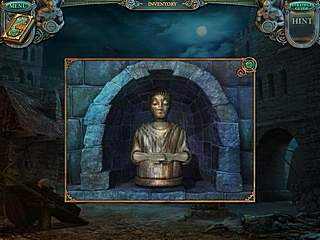 Echoes of the Past: The Citadels of Time follows the typican pattern of the modern hidden object/adventure games genre. The production values are quite high which helps enjoy the game even when there is nothing to really surprise you if you are not new to the genre. Now your task is to find the missing pieces of a clock. The first thing that happens to you in this game is you meet this charming old lady that you can see in one of the images here. Okay maybe she isn't that charming. She is a witch who turned everything upside down. Her curse messes up the time locking you in a certain time period and place. Now your task is to find the missing pieces of a clock. That will help you and other characters that you meet along the way. It was nice to hear the voices used to create this creepy atmosphere. Not all dialogues are voiced, so you will have to read too. The graphics are absolutely beautiful with many details and animated areas. The gaming part has nothing surprising for those who are familiar with this genre. There is a lot of going back and forth searching for clues and interactive areas. There is a lot to do in that part of the game. Then there is also many hidden object scenes where the items are placed in a very appropriate way and don't make it look like one big heap of things that don't belong. The mini-games are all skipable but you might still enjoy playing them. They offer some new twists for the same old puzzles. There is also some additional content in the Extras section. Most of it is locked when you start, but if you enjoy the game, you will most probably enjoy the extra adventure. 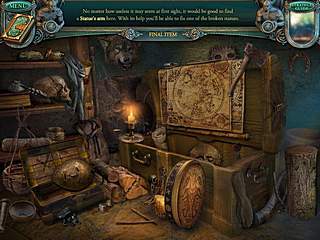 This is Echoes of the Past: The Citadels of Time for Mac OC review. Download this game here.